No matter where you land on the diet spectrum, more whole, plant-based foods can enrich your life and improve your health. If you're transitioning to a plant-based diet or you just want some ideas for preparing scrumptious veggie dishes, Heather Crosby provides a step-by-step guide to simply adding more delicious, health-boosting meals to your existing routine, whether you're a meat-eater or a vegan. 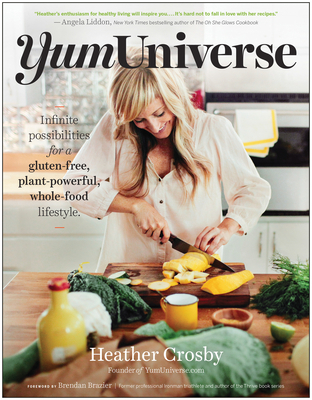 YumUniverse: Infinite Possibilities for a Gluten-Free, Plant-Powerful, Whole-Food Lifestyle offers a creative collection of more than 150 craveable recipes without meat, dairy, gluten, or soy. But this is more than just a cookbook--it's a treasure chest that will help you build health-promoting habits and recipes of your own for a lifetime. As a former veggie-phobe, Heather knows firsthand how overwhelming yet rewarding the transition toward a plant-powerful diet can be, so she offers expert advice for folks seeking to adopt and maintain a whole-food approach to what they eat. Fans of YumUniverse.com, Heather's inspirational food website, and new readers alike will discover recipe goodness like her Fig & Caramelized Onion Tart and Almond-Cardamom Cream Chia Pudding with Fresh Berries, as well as divine desserts like Mexican Unfried Ice Cream and Chocolate & Salted Caramel Stack Cake. A plant-powerful, gluten-free lifestyle is delicious and doable. So, say "goodbye" to the dieting roller coaster and embrace a long-term wellness adventure with tasty, healthy, plant-inspired cuisine. Heather Crosby is a T. Colin Campbell Foundation certified plant-powerful wellness coach who has developed a unique and well-loved collection of over 500 gluten-free, plant-based recipes on her popular website YumUniverse.com. In an effort to kick medication and heal naturally from disease, she's been fine-tuning the maintenance of this lifestyle for almost a decade, and sharing what she's learned for years with thousands of folks all over the world. She's not interested in labeling you. Instead, she's dedicated to helping folks incorporate more health-boosting whole, plant-based foods into their lives so we can all say "goodbye" to dieting and "hello" to building a healthful, inspired lifestyle for the long haul.